Is Contagion Poking Its Head Out of Its Hole? Seemingly all of a sudden, the name General Electric created a pang of panic this week. This old venerable name has been tarnished for years and its stock has been on an escalator downhill from $60 in 2000 to below $8 this week. But the value of a stock doesn’t cause panic. 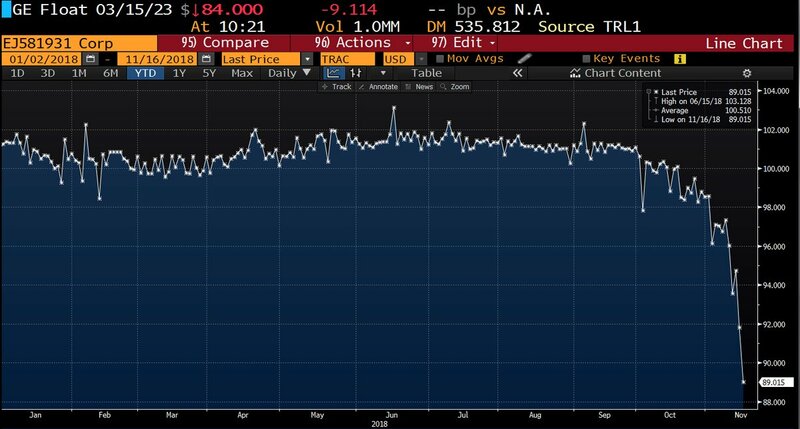 The prospect of a company’s bonds crashing because of “lack of liquidity” can create panic. J Pierpont Morgan‏ @pierpont_morgan Nov 12 – $GE euro denominated long bond (subordinated) down 5 points today, spread an astonishing 45bp wider. First the stock, then the preferred, now junior debt: GE capital structure crumbling before our eyes. What if GE bonds were downgraded to junk? GE has $120 billion of Debt and the entire US Junk Bond market is $1.2 trillion. So GE itself is 10% of the entire Junk Bond market. Scott Minerd‏Verified account @ScottMinerd Nov 13 – The selloff in GE is not an isolated event. More investment grade credits to follow. The slide and collapse in investment grade debt has begun. He is not the only one. Paul Tudor Jones, a legendary name on Wall Street, warned this week that “We are in a global debt bubble, early innings of the unwind.” His diagnosis of the problem is absolutely accurate. Tragically, the people who run America’s monetary policy learned nothing from the 2008 crisis. In fact, they tripled down. So now we have a bigger debt bubble than in 2008. This is obviously unsustainable and so it will not stay sustained. The big question is how to manage this debt bubble. 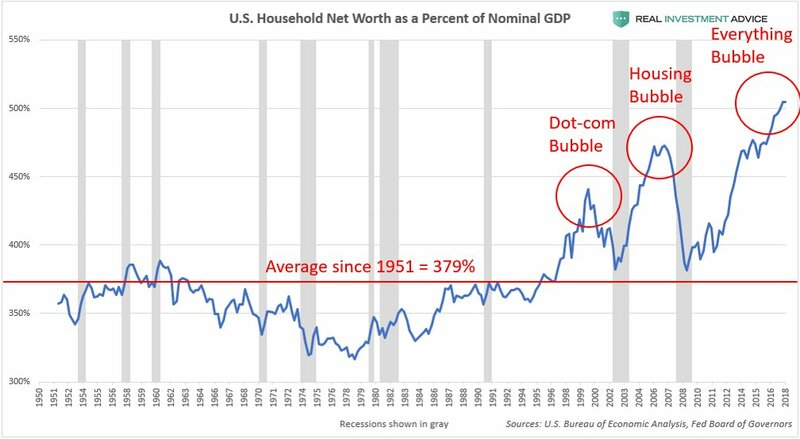 We all know what happened in 2000 and in 2008 when the Federal Reserve kept raising rates until they burst those bubbles. They create broad & deep recessions that can only be cured by the Fed injecting another massive flood of money into the system. No one wants a repeat of that solution. But we seem to be on that path again. Just look at the past month. The US Federal Reserve declared it was hell bent on raising rates to their own perceived notion of “neutral”. The stock market has gone down hard; housing & construction industry has been hot very hard; growth areas like semiconductors & technology have suffered stunning falls. The US economy is slowing down before our eyes. On top of this, Europe faces turmoil in Italy and in Britain about Brexit. That can only be negative for economic growth in Europe. Think back and you will remember America was not all that different back in July 2016. The 10-year Treasury rate had fallen to 1.38% and America seemed mired in jobless recovery. Contagion had spread from the economic system into the political system. Fortunately, unlike economics, politics is not the preserve of a handful of “experts” of unquestionable self-proclaimed eminence. The American People, via our well balanced electoral state-based system, elected Donald Trump as our President. Then he actually delivered what he had promised – restrictive regulations were eased or removed, a tax cut was passed and the US economic growth went into a new gear. And contagion went back into its hole. Ask yourselves, have you heard the dreaded D-word, deflation, since President Trump’s election? Well, now we are beginning to hear whispers of it again. A month ago, the Fed Chairman threatened to raise rates well beyond current levels, levels that have already damaged the US housing & construction industry & caused intense stress in the corporate bond market and in growth stocks. This week we saw the specter of Maxine Waters, soon to be Chairwoman of the House Finance Committee, promising to reimpose “regulations” on US banks. So all of a sudden the conditions that led to a higher plateau of growth in 2017 & 2018 may be replaced by job-killing, deflation creating policies that only the contagion would love. Fortunately, some good signs have emerged. Fed Chairman Powell toned down his rhetoric this week and so did Vice Chairman Clarida. Hopefully, they will stop worrying about how their precious “independence” from the President looks and begin worrying about how they look to the American people. Hopefully they will run the US economy “hot” even at the risk of getting some inflation. This is the week of Thanksgiving and a time to be optimistic. In that spirit, we hope the House Democrats will work with President Trump to launch an infrastructure program in mid-2019. That will bring capital into inner cities and launch the US growth into a sustainable 3% level. After all, growth is the only cure for deflation. And that will send back the deflationary contagion back into its hellhole.